Click here to read story I’ve Got a Little List. Birth date and place c. 1836 Ireland. Physical Description Height: 5 ft. 7¾ ins. Complexion: fair. Eyes: grey. Hair: dark brown [Chatham Prison Pcom2-2]. Height: 5 ft. 7 ins. Complexion: sallow. Eyes: blue. Hair: brown. Face: long. Build: thin. Distinguishing marks: D left side [Fremantle Prison Acc 1156-R23]. Marriage date and place 1875 Bunbury, Western Australia. Children Robert Charles b. 1876, Australind, Western Australia. Ernest b. 1877 Brunswick West, Western Australia. Walter b. 1879 Harvey, Western Australia. George Patrick b. 1882 Parkfield, Harvey, Western Australia. Amy b. 1885 (d. 1886 16 months) Rosamel, Australind, Western Australia. Charles b. 1887 Rosamel, Australind, Western Australia. Albert b. 1888 (d. 1888 1 day) Rosamel, Australind, Western Australia. Joseph b. 1890 (d. 1891 13 months) Rosamel, Australind, Western Australia. Lily Ada b. 1900 Bunbury, Western Australia. 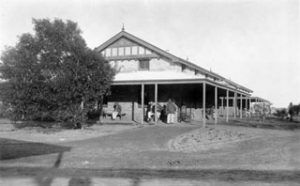 Death date and place 29 Oct 1919 Old Men’s Home, Claremont, Western Australia. Burial date and place October 1919 Karrakatta Cemetery, Western Australia. Roman Catholic Area, Section BB, Gravesite 0057. Regiment(s) 50th (The Queens Own) Regiment. Regiment No. and Rank #4321 Private. Attestation date and place after 1851. Service/Campaigns Crimea [Cons 752, Item 1919/2479]. Medals, Clasps and Badges NOT on Crimea War Medal Roll [WO100-30]. District Courts Martial Colchester, Essex, England [HO86-009-86]. Trial: 15 Jul 1857. Absent. Sentence 112 days hard labour and stoppages. General Courts Martial Colombo, Ceylon [Acc 1156-R23]. Trial: 11 Sep 1862. Firing his rifle into a storeroom with intent to grieviously harm a Colour Sergeant. Prison and Register # Sep 1862 Colombo 3 months 20 days. Dec 1862 On board Louisa 4 months 4 days. 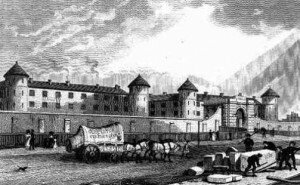 5 May 1863 to 24 Mar 1864 Millbank Prison #7150. 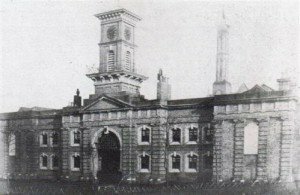 24 Mar to 14 Jun 1864 Chatham Prison #6475. 14 Jun-1 Jul to 12 Sep 1864 Convict Ship Merchantman #61 – 73 days passage from Portland. 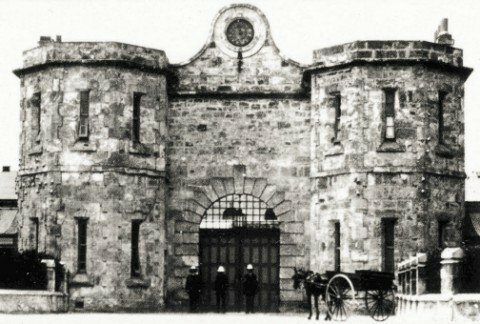 12 Sep 1864 Fremantle Prison #7968. Labourer. General Servant. Splitter [Ac 1156-R2] . WA Ticket of Leave 30 Apr 1868 . 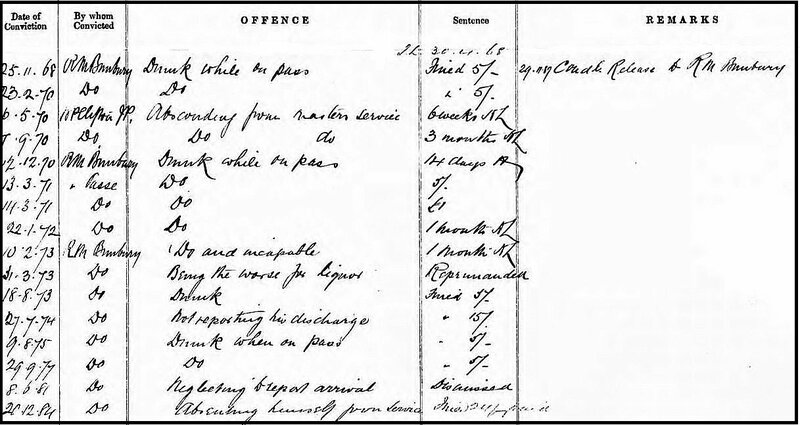 Before a Resident Magistrate Click here to read offences from 25 Nov 1868 to Dec 1884 [Acc 1156-23]. WA Warrant of Remission 15 Jan 1898. WA Certificate of Freedom 1 Mar 1898.